Boston (BUSINESS WIRE): At 2.8% per month in Q2 2018, overall churn in the wireless industry reached its lowest level since Q1 2009, driven by continued strong performance in postpaid churn and a prepaid churn level not seen since 2007. According to a new report from Strategy Analytics, “India & US Drive Wireless Churn to Lowest Level This Decade”, content bundling, multi play, and digital self-service options have been key to improving customer loyalty in the wireless market. These findings draw on data from the Strategy Analytics Wireless Operator Performance Benchmarking database, which tracks operational and financial KPIs for 259 operators which collectively account for almost 85% of the world's cellular subscriptions. India and the US have seen strong churn improvements in 2018 as a new ‘post-Jio’ landscape stabilizes in India and as T-Mobile and Sprint continue postpaid gains in the US. 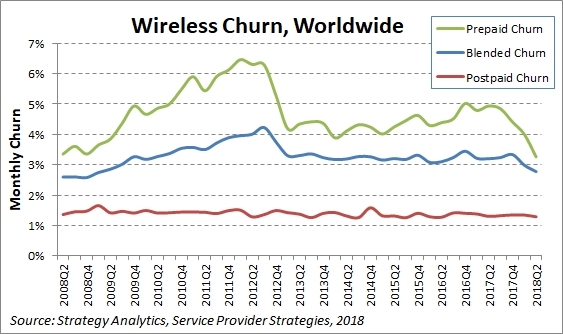 Wireless Churn, Worldwide (Graphic: Business Wire).